City of Hesse, situated on the Rhine. Jews lived there from the earliest times, for they are mentioned by the traveler Benjamin of Tudela, who visited Bingen toward the middle of the twelfth century. In May, 1254, Bingen joined the union of Rhenish cities which, for financial reasons, protected the Jews. But this favorable condition of things was soon changed, for at the time of the Black Death (1348-49) the Jews of Bingen, in common with the other Jews in Germany, suffered severe persecutions. The community, however, was never quite extinguished. In the first half of the fifteenth century a rabbinical synod assembled there. 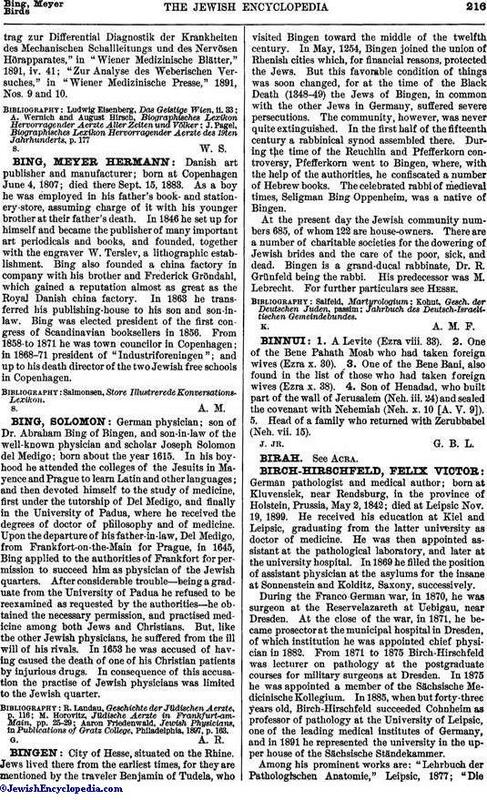 During the time of the Reuchlin and Pfefferkorn controversy, Pfefferkorn went to Bingen, where, with the help of the authorities, he confiscated a number of Hebrew books. The celebrated rabbi of medieval times, Seligman Bing Oppenheim, was a native of Bingen. At the present day the Jewish community numbers 685, of whom 122 are house-owners. There are a number of charitable societies for the dowering of Jewish brides and the care of the poor, sick, and dead. Bingen is a grand-ducal rabbinate, Dr. R. Grünfeld being the rabbi. His predecessor was M. Lebrecht. For further particulars see Hesse.